Has A 8.0 Capacitive Multi-Touch Touch-Screen Which Helps You For Accurate Zoom. It Runs On Google Android 2.3.1 Operating System Which Specifically Designed With Easy interface menu For Quick Entertainment Experience. 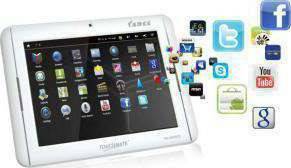 TOUCHMATE TABLET has 2-IN-1 Features: (I) You Can Quick Access To Internet & Enjoy Facebook, Youtube, Twitter, MSN, Emails, skype, Many Google Apps & Unlimited Internet Contents. (II) TOUCHMATE Tabzz Supports HD Video Playback By Built-In HDMI-Out Port Which Can Be Plugged Directly To High-Definition LCD TV To Convert LCD TV Into Smart Internet TV Which Is Unique Feature. (This Feature worth of USD 200.00 FREE with MID800). Remote Functions Can Be Control By Wireless Mouse (Bundled) Plus HDMI cable also bundled. It Contain 1.2 GHz Arm Coretex A8 High Speed Processor For Quick Internet Access, Browsing, Real Motion Video & Movies Playback. Wi-Fi Wireless Internet, Bluetooth & Dual Camera (Front & Back) For Photo n Video Recording & Chatting. Enjoy Ultimate ALL-in-one TOUCHMATE Tabzz....TOUCH sence is Extra ordinary which you feel when use..
We offer express delivery to Dubai, Abu Dhabi, Al Ain, Sharjah, Ajman, Ras Al Khaimah, Fujairah, Umm Al Quwain, UAE for Touchmate MID 832 32(16+16)GB. We offer the best price for Touchmate MID 832 32(16+16)GB in Dubai, UAE. Buy now with the best price!